Way back in 1981, long before the 1000 kilometre Finnmarksløpet became the intensely branded and marketed dogsled race it is today, Sven Engholm and his determined team of huskies ran across snowy Finnmark and won…against 2 other teams. It was no small feat however, no matter the number of teams. A sleddog race run continuously over 5-6 days, in extreme weather conditions, is a challenging trial against the elements, for both man and dog alike. Nonetheless, Sven Engholm continued to compete, and to win. Another 10 times in fact, with his last 1000 kilometre race in 1994, seeing him beat the closest challenger by 5 hours and 30 minutes. These days, he’s traded all the grit and glory of racing, for the decidedly tamer business of taking tourists on dogsled day tours or more arduous week long trips. On the morning of our eagerly anticipated day trip on the sleds, the skies were gloomy and casting a bluish glow over the landscape. The dogs didn’t seem to mind though, and the snowy silence was replaced by a raucous chorus of barking and howling as they were suited up for the trip. We too, geared up in reindeer parkas, thick gloves and masks to battle the cold and the wind. After a quick lesson on what to do when (not if) we fell off the sled, we were off with a jolt…and immediately crashed into a tree right next to the dog yard. That would be Agri’s one and only fall of the day. Despite the bumps and bruises sustained from falling, the ride was nothing less than sheer exhilaration. As we raced across windy plateaus, up and down small hills, dodging tree branches, and desperately trying to steer around corners that seemed to sneak up on us a little too fast, I found myself longingly wishing we’d signed up for one of the week long husky safaris. Especially when the day ended far too soon, and we had to bid our dogs adieu. Engholm Husky is located 6 kilometres away from Karasjok in Northern Norway. We covered approximately 30 kilometres during our 5 hour day trip with the huskies. 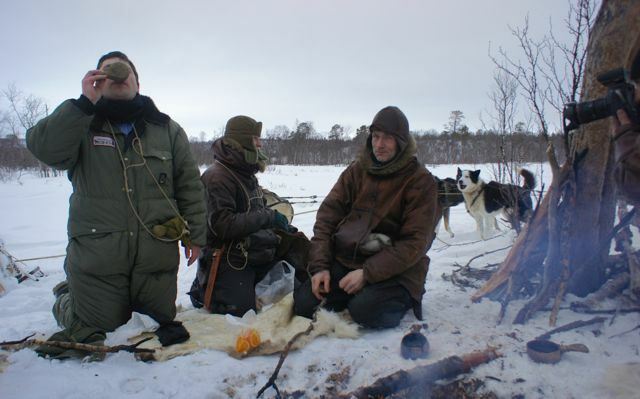 It included a campfire lunch (toasted sandwiches and tea or coffee), and free use of the reindeer parka. Other winter gear like gloves and boots had to be rented separately. We paid 1600 NOK ($295) each for our trip, but it looks like the price has gone up to 1700 NOK this year. From November to May, it’s possible to participate in dogsled programs running anywhere from 4 to 11 days, with prices ranging from 7,300 – 34,600 NOK ($1350 – $6400). During these programs, you can drive your own dog team, share a team with someone or simply just sit in one of the sleds and enjoy the ride. Summer programs are also available. Details of what’s included, and dates available can be found on Engholm Husky’s website. Today, the Finnmarksløpet is a huge event with over 140 teams and more than 1500 dogs participating. Usually run in March, the race begins in Alta, Norway, crosses Finnmark to Kirkenes and ends back in Alta. It’s the longest dogsled race in Europe, with approximately half of the teams running the entire 1000 kilometre distance. 2014’s winner was Norway’s, Sigrid Ekran. The 2015 Finnmarksløpet is slated to run on March 7th. Amazing! I did this in Finland ~ such a great experience! Hey John!! It was pretty fantastic. 🙂 Whereabouts in Finland did you go sledding? It was Lapland, Finland, so right up north! I actually spent a day in Norway when I flew out, lovely place with lovely views…bitter cold though, right? haha! Brrrrr……. just looking at the pictures is making us cold. But man, this looks AWESOME! I’ve never heard of Balto. 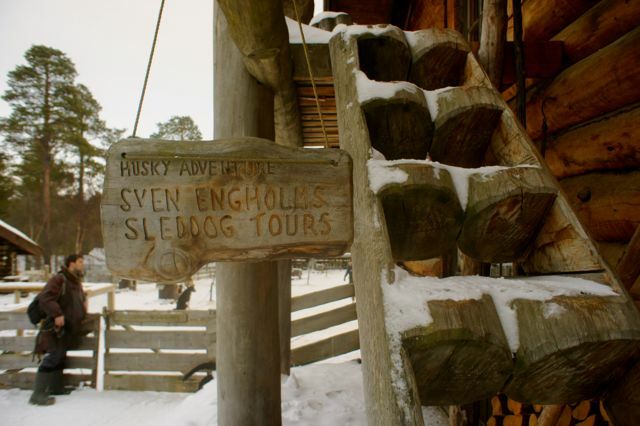 🙁 Yeah, everything up there was really expensive, but I did a lot of comparison shopping on the dogsledding, and I thought Engholm definitely provided the best value and the most authentic experience. Most tours only go out for a few hours, cost just as much and I would guess, don’t sled through all the different environments that we got to. I am glad you had the same kind of experience as we had. Absolutely one of my best travel experiences. The northern lights that same evening made our day never to forget. I know you would Shelley hahaha. We are planning to go on a 3 month trip beginning of next year. Honeymoon. Our epic centre is going to be Mongolia. We don’t know which way we going after that, east or west. But i’ll keep you posted of course. Still love your blogs. Keep up the fantastic stories. I vote east. 😉 Keep us updated. Reblogged this on The New B.P.